BATON ROUGE – Nicholls State University Student Government Association (SGA) President John Lombardo will serve as the 2011-12 Student Member of the Board of Supervisors for the University of Louisiana System. Lombardo was chosen today by peer SGA Presidents in the UL System to represent them on the Board. “I have been committed to service all of my life and know that this will be a tremendous learning experience for me. I am looking forward to representing all 83,000 students fairly with no favoritism towards any institution because I believe united is the best way to lead our system to success,” said Lombardo. A senior Government major, Lombardo has served in the SGA throughout his tenure at Nicholls, including as a senator and vice president. He is a member of Kappa Sigma Fraternity and the Circle K International Service Organization. He has completed over 1,500 hours of community service since high school, has worked for the LA 1 Coalition and the BP Petroleum Preservation and Maintenance Facility. Lombardo will take time out of an internship with Congressman Jeff Landry in Washington, D.C. this summer to be sworn-in at the June 24 Board meeting in Baton Rouge. “We are delighted to welcome Mr. Lombardo to the UL System Board. He brings an enthusiasm for service and a willingness to learn that bodes well for a successful year,” said UL System President Randy Moffett. The 16-member Board is constitutionally created with 15 members selected by the Governor for six-year terms and one student member elected annual from the eight SGA Presidents. Lombardo will assume the duties of outgoing student member Brook Sebren from the University of Louisiana at Monroe. Current members of the Board are Chair Winfred Sibille of Sunset, Vice Chair Wayne Parker of Choudrant, Parliamentarian Russell Mosely of Baton Rouge, Paul Aucoin of Thibodaux, Andre Coudrain of Hammond, Edward Crawford, III of Shreveport, Jimmy R. Faircloth, Jr. of Alexandria, David Guidry of Harvey, E. Gerald Hebert of Kenner, Louis J. Lambert of Prairieville, Renee Lapeyrolerie of New Orleans, John O. LeTard of Zachary, Jimmy Long, Sr. of Natchitoches, Jimmie “Beau” Martin, Jr. of Cut Off and Carl Shetler of Lake Charles. In addition to choosing a student board member, the SGA Presidents from the eight UL System universities that comprise the Student Advisory Council (SAC) selected new leadership positions for the upcoming year. 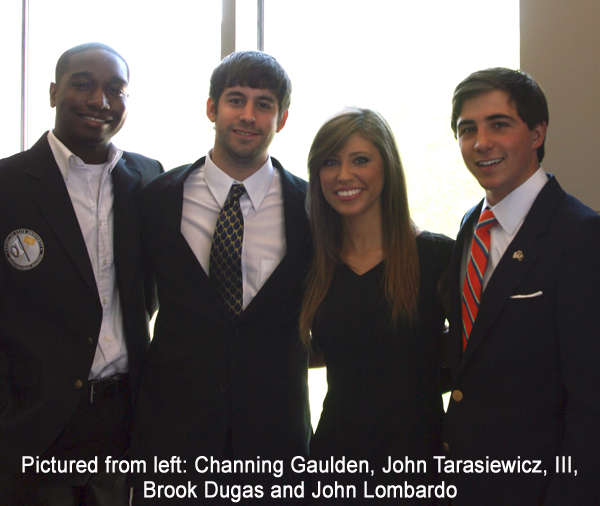 University of Louisiana at Monroe SGA President Brook Dugas will serve as SAC Chair, McNeese State University SGA President John Tarasiewicz, III, will serve as SAC Vice Chair, and Grambling State University SGA President Channing Gaulden will serve as the SAC Service-Learning Coordinator. Among the initiatives SAC plans this year will be the development of a system-wide student service project.